I use English rush cut from the upper reaches of the Thames to repair rush seated chairs. It is important that the seat frame is sound before the chair is re-rushed and I can arrange for minor repairs to be done before chair is re-seated. I re-cane chair seats, arms or backs using standard six-way or other patterns and accept commissions for curves, medallions and sun-rise chair backs. 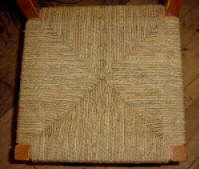 I also do close caning and loom cane seats. 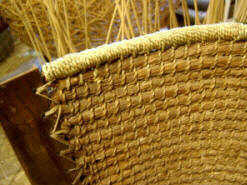 Repairs to wicker furniture, Orkney chairs etc. 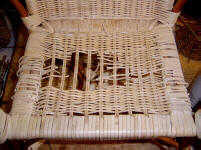 I can often repair wicker or woven furniture, provided the basic structure is sound.